On March 20 Western Forest Products and the Huu-ay-aht released a joint statement, describing a Reconciliation Protocol Agreement for “a safe, competitive and forward-looking forest sector in the Alberni Valley.” The agreement will explore the “economic vibrancy of the Huu-ay-aht Ha-houlthee,” including its Treaty Lands and the surrounding territory. This agreement brings possibility of the Huu-ay-aht strengthening its involvement in the forestry industry. Currently HFN Forestry is the largest company in the Huu-ay-aht group of businesses, employing 13 full-time staff, plus another 50 contractors and suppliers. “Long-term sustainable revitalization of the forest sector in the Alberni region is a critical component of Huu-ay-aht’s efforts to achieve reconciliation, self-reliance and a brighter future for Huu-ay-aht citizens and everyone in the region,” said Chief Councillor Robert Dennis in the joint release. The agreement pledges to respect the Huu-ay-aht’s sacred principals of hišuk ma c̓awak, - “everything is one”; ʔuuʔałuk – “taking care of”; and ʔiisaak – “greater respect”. The reconciliation agreement builds on a deal WFP and the First Nation announced in May 2017. The Huu-ay-aht’s $3-million purchase of three properties and a dry land log sort from WFP in Sarita Bay was made to expand the First Nation’s control over the area, where it hopes to develop a massive export facility with Steelhead LNG. 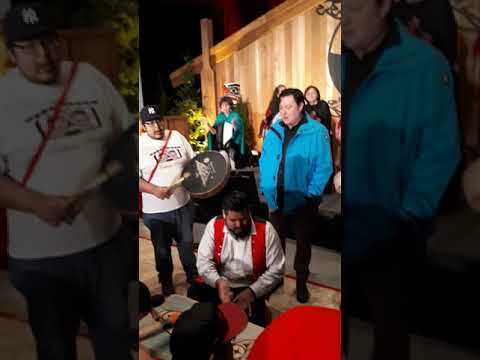 The purchase arrangement allows the Huu-ay-aht to lease the dry land log sort back to WFP, while the logging company can harvest 200,000 cubic metres of timber from the First Nation’s Treaty Settlement Land near Bamfield. Employment and training for Huu-ay-aht members is also attached to this deal with WFP. “Together, Huu-ay-aht and Western are implementing those agreements as they look for opportunities to operate across a larger land base,” stated the First Nation in the March 20 release. “Reconciliation requires a shared vision of the future, along with trust and an unwavering commitment to embark on that journey together,” said Shannon Janzen, WFP’s vice-president and chief forester, in the joint statement released with the Huu-ay-aht. With a provincially regulated annual allowable harvest of six million cubic metres of timber, WFP runs seven sawmills, including the Alberni Pacific Division in Port Alberni. In July 2017 the company announced the closure of its other Port Alberni facility, the Somass Sawmill, directly affecting the employment of at least 70 staff. Rising operating costs and a lack of log supply were cited as factors for the closure. The recently announced partnership represents a growing involvement in the forestry industry that the Huu-ay-aht has been shut out of in the past, according to a ruling from Canada’s Special Claims Tribunal. Last year the federal government agreed to go cooperate with a $13.8-million settlement for the historical mismanagement of the Huu-ay-aht’s forest land on the Numukamis Reserve from 1948 to 1969. In 1938 the Huu-ay-aht surrendered to the federal government all marketable timber on 1,100 acres of land in Barkley Sound “to sell in terms most conducive to our welfare,” according to details cited in the tribunal ruling. In 1942 a 21-year harvesting licence was issued to Bloedel, Stewart and Welsh, but despite a significant rise in timber prices at the time, by 1948 no wood cut from the reserve land was sold. The Huu-ay-aht asked the feds to cancel the licence and replace it with something that would benefit the First Nation, but this request was denied.